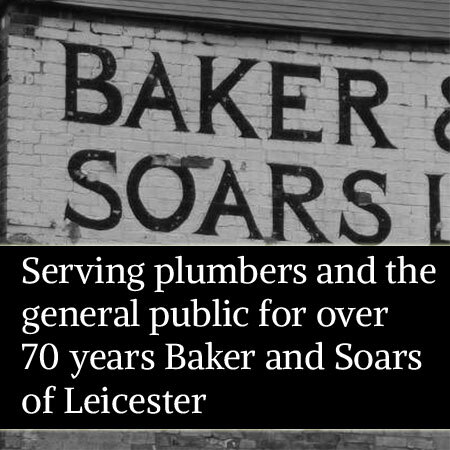 Baker and Soars is a company that serves the public and the plumbing industry as a leading plumber's merchant based in Leicester and online. With over 70 years of experience Baker and Soars deliver the highest standard of service and the widest choice of leading brands at competitive prices, giving you a refreshing experience to match your budget. From the latest innovations in wetroom technology to the classic and traditional we stock and supply an ever growing range of common and hard to find products. Baker and Soars can offer you a simple budget suite through to the very best in luxury bathrooms at highly competitive prices and a standard of service that has kept us at the forefront of industry. For trade we offer our customers the option of both cash and credit accounts. Our staffs are equipped with wide and extensive depth of knowledge and experience that can help you and advise you on all your plumbing and bathroom questions. Visit us at the trade counter, call us or email and we will do our best to assist you with your needs. With such depth of experience and proven quality of service you can rest assure you are in capable hands.